I am working on an ethanol plant and the ground grid is 4/0. From the ground grid to building steel and large stainless steel tanks they are using #2 XHHW for bonding..This is the GEC correct? They have also used this #2 from the grid to bond the case of some very large 4160V Motors..Should this not be sized by the largest OCPD? You use 250.66 to size ground electrode systems based on the service conductor size. 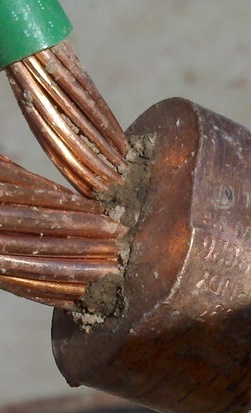 #2 gets you up to a 350Kcmil copper or 500Kcmil aluminum service conductor. If the service conductor is larger than that you need a bigger GEC. The 4/0 grid may be the GEC, or it may be a 'ground ring' that the various conductive items/equipment are 'bonded to'. ie: an equipotential grid. IF it is a 'eq grid', then it was designed or spec's by a PE/EE. As to the motor case...sounds like a 'eq grid' to me. Last edited by HotLine1; 05/07/13 07:33 PM. The GEC is the conductor that lands on the grounding bus bar in the service disconnect enclosure where the main bonding jumper resides. Everything else is a jumper or an electrode. #2 from 4/0 to building steel, tanks, or any motor..
Just does not look right to me.. I drive a ground rod run #6 to meter base this is the GEC correct? The GEC is run with circuit conductors..an equal potential grid is a grounding mat/grid connected to ground rods..for the whole plant they have 4/0 in the ground and #2 insulated ground for grounding tanks, motors or building steel..thanks for the replies..
Last edited by akmaster; 05/08/13 07:42 PM. The only way a GEC can be a #6 is if the only electrodes are rods. 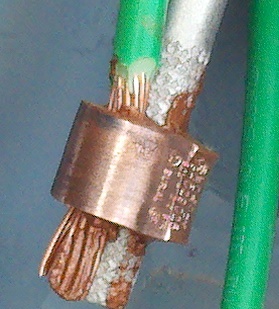 250.66(A) says " that portion of the conductor that is the sole connection to the grounding electrode shall not be required to be larger than 6 AWG". If this is going on to another electrode, the GEC must be sized to the best electrode you have in the system, up to what you get from the 250.66 table. "I drive a ground rod run #6 to meter base this is the GEC correct? The GEC is run with circuit conductors"
The 'GEC' terminates at the neutral block in first means of disconnect of the service. Your POCO may allow it to be terminated within the meter base, but that is forbidden here by PSE&G. 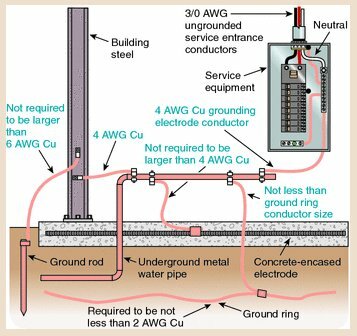 The 'ground' with the circuit conductors is "EGC" for Equipment grounding conductor. We had two policies here from the same PoCo. In Collier County they wanted the GEC in the meter can. In Lee County they wanted it in the service disconnect. I understand they have now decided the service disconnect is the right place. The grounding electrode conductor connection shall be made at any accessible point from the load end of the service drop or service lateral to and including the terminal or bus to which the grounded service conductor is connected at the service disconnecting means.